I remember reading a recipe about chicken and rice casserole before, and was too lazy to look it up on the internet. So I simply gave this a go without knowing if I got the ingredients right - daredevil me in the kitchen! As my husband was home late, I left the dish in the oven for a little too long, so the chicken was a bit dry. Other than that, it was okay so I was pleased. 1. Heat the oven to 190 degree C.
2. Season the chicken with salt and pepper, then brown them in a pan over high heat. Remove to a plate. Lower the heat to medium, and cook onions and garlic until the onions are soft. Remove to a plate. Add mushroom and dry saute them to release some moisture. Remove to a plate. 3. Deglaze the pan with the white wine, and heat to reduce to about 1 tbsp. Add stock and bring it to a boil. Remove the pan from heat, then add cream, sour cream, and dried herbs. 4. 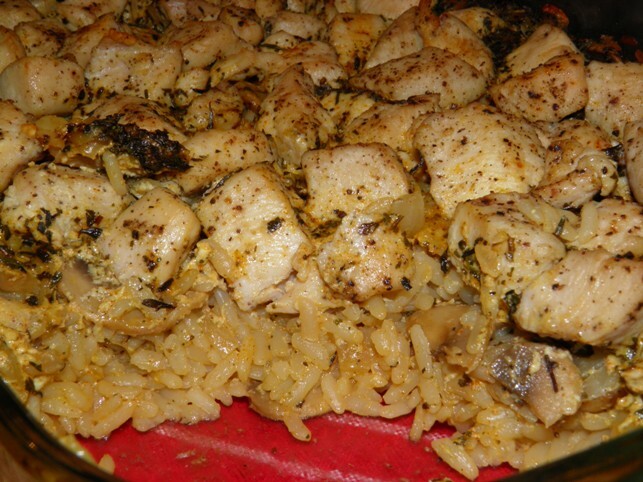 In a casserole dish, mix together rice, onions, mushroom, and sauce. Then lay the chicken over the top in a single layer. Cover the dish and bake for about 45 minutes in the oven. If the dish is still a bit watery, uncover the dish and cook in the oven for a few more minutes.